Love or hate the James Bond phenomenon, we bet you've had a hankering to get your hands on a nifty bit of kit that hides a secret camera or a magnet fit for unzipping ladies' dresses at some point in your fantasy life. Undercover investigation is cool, right? Well, here's your chance to experience going deep, deep undercover. The Environmental Investigation Agency harbours the James Bonds of the natural world. Based in London but operating globally, It's a charity that's been exposing environmental crime for 25 years, with a tireless campaign to scupper the villains of the tiger skin, ivory and whale trade, combat illegal logging and deforestation and generally put a stop to the devastating effects of all kinds of environmental crime. 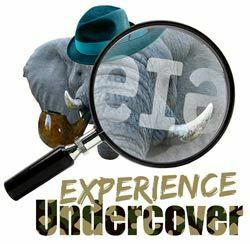 To celebrate its first 25 years and raise awareness of its work EIA is holding a free prize draw, the Undercover Experience. Just fill in the form for a chance to win an exclusive opportunity to spend the day at EIA's top secret HQ (um.. Upper Street, Islington) learn to use covert filming equipment (no need for trench coat or fedora) and find out how it is used in an investigation. One aspirant investigator will walk away with a Minox Digital Spy Camera (leather glove not included). For free entry and more information please visit their website. Deadline 30th September. Check out their amazing work while you're there and, pssssst, it's not a secret, so pass it on.